In part 1, I asked for guesses about the genetic identity of my beloved mutt, Darwin, to see if anyone was closer than the genetic test we did to try to uncover his ancestry. Surprisingly, of the four breeds that the test identified as being present in him at some level, none of them was beagle -- or a hound dog of any type. (As Susan point out in the comments, a dachshund is a hound. I actually was the one predicting he had some dachsund in him before we even did the test!) The test came back and told us that Darwin has contributions (at some level) of mastiff, dachshund, Saint Bernard and Shih Tzu. Let's back up and see whether that could possibly be true. All the interest in doggie DNA is not just due to a lot of overindulgent pet owners. 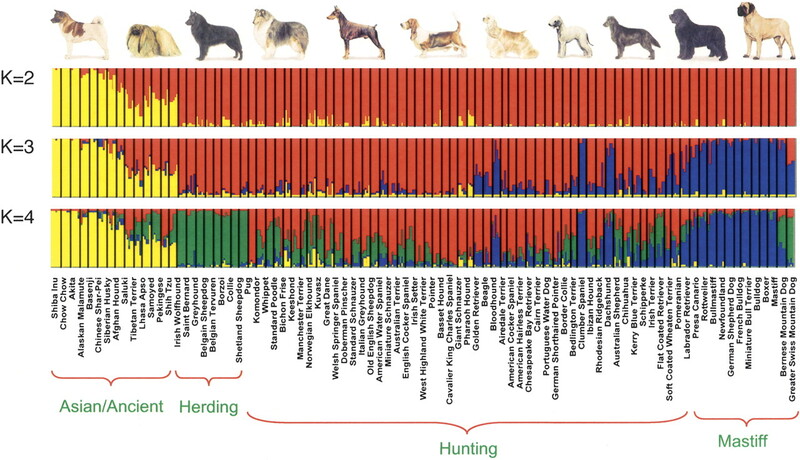 Dogs are very good models in which to study the correlation between disease and genomics. Let's start with some definitions, which you probably already know, but that I had to look up. DNA is a double helix that looks like someone took a ladder and twisted it. The backbone, which corresponds to the long uprights of the ladder, is made of phosphate and sugar pieces. Periodically attached to the backbone and forming one half of each rung is one of four types of amino acids nitrogenous bases (Thank you Shane): A (adenine) , T (thymine), C (cytosine) and G (Guanine). The amino acids are particular about how they link to each other: A bonds to T and C bonds to G. My diagram is adapated from a diagram on wikipedia. Genes, which are made from DNA, tell cell s what proteins to make and how much of each to make. For example, genes tell your body how much melanin to make, and that helps determine your skin color. Some traits are attributable to single genes (like cyctic fibrosis), while other traits are due to an interwoven combination of genes. We have a lot of genes: estimate range from 25,000-35,000 genes in the average person. The collection of genes is called the genome, and the genome is stored on one or more chromosomes. When two creatures make a third, the child (or puppy) inherits DNA from each of the parents, although not always equitably. Some genes are recessive, which means that they yield to genes with stronger opinions about how the body should work. DNA is stored in the nucleus of mammals. Every time a cell divides, the DNA has to replicate itself so that both cells have DNA. This doesn't always happen identically - the process can be akin to a game of telephone. If you were to examine a hundred copies of a gene in your body, you'd find a number of different variations. Each unique variation is called an allele. In addition to physical features like hair color or eye color, many diseases are transmitted genetically. (Other diseases may have a genetic proclivity, but bad habits (drinking, smoking and eating wrong) can change your risk for the disease.) So understanding how a disease is correlated to genetics is important from the perspective of making sure a person doesn't contract that disease. With the exception of some exotic cats, like Persians or Bengals, cats look pretty much alike. Most dog breeds were created by people in just the last 200-300 years, and our obsession with bloodlines means that you can have a population of dogs where you know exactly who is related to whom. The diversity of traits between different dog species is pretty amazing. You just don’t see the diversity in humans that would compare to the difference between the Chihuahua and the Great Dane. Genetic variation between people is about five to seven percent. Genetic variation between dog breeds is around 25-28 percent. In order to be certified as a purebred dog, the parents have to be certified, which means that the breeding population pool is fairly small and closed. In fact, some breeds have been in danger of wiping themselves out because they have been so inbred. There are more than 350 inherited disorders in purebred dog populations, with many of them specific to specific breeds. Given our closely aligned heritage (same environment, food, etc. ), it isn't so surprising that people and dogs share many of the same diseases. I was kidding a cow researcher about chances of cancer being greater because of the larger number of teats when he informed me that cows don't get breast cancer. Dogs, however, have many of the same diseases people get, and specific breeds are often predisposed toward specific diseases. Doberman Pinschers and Labrador Retrievers are among the few animals that can have narcolepsy. (Narcolepsy is due to a single recessive gene.) Chow Chows are predisposed toward stomach cancer. Dogs DNA is more similar to human DNA than mouse DNA, making dogs a better predictor of the impact of drugs or other treatments. Dog cancers are much more similar to human cancer than rodent cancers. Humans often participate in family studies, where a disease is studied among members of a family to try to identify genetic links. A breed of dog is like a very large family, making dogs ideal models for understanding human illnesses. The first dog genome to be sequenced was a standard poodle in 2003 that was about 80% complete. Trivia: The poodle belonged to Craig Venter. Their study showed that dogs and people have about 18,473 genes in common. Mice and people share 18,311 genes. In July 2004, a 99% complete boxer genome was released. What they're looking for are variations that distinguish the breeds. Two different types of variations have proven to be most important in correlating traits and genes. Microsatellite repeats are areas that have different repeats of some sequence. For example, CA is frequently repeated different numbers of times. The diagram below shows three genes that are identical, except for the numbers of times the "CA" is repeated. The other kind of variation is single-nucleotide polymorphism, which is called SNP and pronounced "snip". In this variation, a chain of amino acids is identical, except for a single acid. These types of differences in ordering are key to finding out which parts of which genes are relatable to some trait. So now to classify the dogs. The AKC, which recognizes about 169 different breeds, divides dogs into classes that are primarily determined by morphology (size, size) and behavior: sporting, hunting, non-sporting, lie-around-the-house-looking-cute, etc. Greyhounds and Italian greyhounds are in the same class, as are basenjis and beagles. Genetically, the classes fall out a little differently. A 2004 Science paper by Parker, et al. looked at 85 representative breeds, with five unrelated (no common grandparents) dogs per breed. They were able to demonstrate a significant genomic difference, but not necessarily between breeds per se. When they analyzed the doggie DNA, they were able to separate the dogs into one of four clusters. Please look at the diagram from their paper before you keep reading - you may want to refer back to it. Cluster 1 is 14 dogs that originate from the most ancient animals in Africa and Asia. This group includes dogs like the Malamute, the Afghan Hound, the Shiba Inu, and Basenji. When the researchers looked at a set of wolf genes (the wolf being the most closely related relative to the dog) from eight different countries, those animals also fell into this group. Cluster 2 is a group of 14 dogs consisting of ‘Mastiff-type’ dogs and include the Boxer, German Shepherd, Lab, Pomeranian and Rottweiler. These dogs have square heads and boxy bodies, but their size ranges from the toy Pomeranian to the Rottweiler. Cluster 4 is the largest cluster and the group most affected by human control over breeding. These dogs were among the most intentional: people bred them to assist them in very specific tasks: bloodhounds, border collies, spaniels, retrievers, setters, terriers, beagles and basset hounds. These are animals that were bred not just to hunt, but to hunt particular animals ranging from little varmints that live underground to lions. Interestingly, some breeds like the Pharaoh Hound and the Ibizan Hound, which are often cited as being among the ancient breeds, actually identify with this group and not the first cluster. The authors speculate that this is because these breeds were basically recreated in the modern time from combinations of other breeds. Level 1: Over 75% of the DNA found in your dog is from the breed listed. Level 2: Each breed listed represents between 37-74% of your dog's DNA. Level 3: Each breed listed represents between 20-36% of your dog's DNA. Level 4: Each breed listed represents between 10-19% of your dog's DNA. Level 5: Each breed listed represents less than 10% of your dog's DNA. Darwin came back as Mastiff, Dachshund, Saint Bernard and Shih Tzu, all level 3. What that basically says is that he's a mutt through and through. He's probably muttier than most, as he's got contributions from a very diverse gene pool: One breed for each of the four clusters. If you search around on the web, you'll find plenty of testimonials from people who say that their purebred Komondor came back identified as a whippet, which is absurd because the two look nothing alike. A Komondor has wooly white dreadlocks and a whippet looks almost bald. But genetically, the two dogs are actually very close, even though their looks are far apart. A pointer and a bassett hound are also close genetically. So are the Saint Bernard and the greyhound. There is an awful lot we still have to figure out about dog genes. Below, you see Darwin's buddy Kona, who is also a mutt and 15+ years old. Kona had laid claim on Darwin's sleeping pad, which is why Darwin is squeezed into Kona's bed. Kona is a cannonical terrier: he looks like a senior citizen Toto (from the Wizard of Oz). So he out-mutted Darwin without a bit of terrier there. The Bichon Frise and Keeshond, incidentally, are right next to the Manchester terrier on the chart. Is the measurement wrong? Probably not. You would naively think that dogs that look the same ought to have some similar genetic make up; however, dogs can have very similar looks and very different genes (the Italian greyhound and the greyhound are in different categories), or very similar genes and entirely different looks. In short, if you're wondering about your dog's ancestry, keep wondering because you're not likely to get definitive answers from the tests that are commercially available. That's not to say that they won't improve in the future, but there is still much we need to learn. Darwin, by the way, was entirely nonplussed by his results. He laid down on the floor, yawned, and demanded a belly rub. I'm often overly anthropomorphic, but I'm pretty sure we was thinking "I'm glad you guys were amused, but y'know that money could have been donated to the spay and neuter program to decrease the number of unwanted dogs and cats that end up in shelters." Ahhhhh! DNA is made up of nitrogenous bases linked with the sugar-phosphate backbone! Proteins are made of amino acids! Sorry for the exclamation points but I work in biochemistry and this is pretty central to what I do. Otherwise great post! Shane: I actually know better than that. I kept writing taurine instead of thymine, too. You are 100% right - I should have written nitrogenous bases, not amino acids. I apparently have bodybuilding on my mind. But the backbone is sugar phosphate, right? The hazards of venturing far afield from one's area of expertise - I really appreciate your taking the time to correct my sophomore error! Thank you! @Shane: Sugar and phosphate, I meant. Er...I don't wish to contradict you on your own blog, 'cause I think you're much smarter and better educated than I am. But...Dachshunds are indeed a type of hound. They were bred to hunt badgers, and the AKC classifies them in the Hound Group. So that's probably where Darwin's "hound" look comes from. Danna: FYI, I'm the blue-eyed child of a person with blue eyes and one with hazel eyes (my mom.) My mom says she thinks one of her grandmothers have blue eyes, so there could be a funky blue eye gene there somewhere. I also have hazel coloring around my pupils. Pretty sure I'm not adopted because the blood types work (me, mom, & dad all O-), and I look a lot like my mom. Susan, you are 100% right and I can't explain why I wrote that other than trying to keep up regular entries with two different blogs and buying a house/arranging to move next month is making me just a little more absent-minded than I usually am. I got out of the shower this morning and got dressed and then realized I hadn't rinsed the conditioner out of my hair. We call them my "administrator moments". The ironic thing is that Darwin is afraid of Dachshunds. He got bit by one when he was young and, although he absolutely loves small dogs, he won't go near anything that looks like a Dachshund. No prob. Good luck with the house purchase. Been there, done that. I've also done the conditioner thing although I didn't get dressed. At least you remembered the conditioner. Oh, when you move in, remember to have your locks re-keyed - unless it's a new house. Otherwise, no telling who might have keys. It doesn't cost much. Good job on the detailed post on dogs!